It's not Indiana Jones, and it's not Uncharted, But it's exciting to know there may still be lost cities out there. 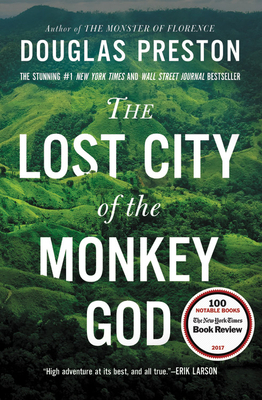 The #1 New York Times and Wall Street Journal bestseller, named one of the best books of the year by The Boston Globe and National Geographic: acclaimed journalist Douglas Preston takes readers on a true adventure deep into the Honduran rainforest in this riveting narrative about the discovery of a lost civilization -- culminating in a stunning medical mystery. DOUGLAS PRESTON worked as a writer and editor for the American Museum of Natural History and taught writing at Princeton University. He has written for The New Yorker, Natural History, National Geographic, Harper's, Smithsonian, and The Atlantic. The author of several acclaimed nonfiction books--including the bestseller The Monster of Florence--Preston is also the co-author with Lincoln Child of the bestselling series of novels featuring FBI agent Pendergast.